I am enthusiastic about most renewables (the giant-scale ethanol from any source and biodiesel fuel are excluded), and I would love to see a wiser use of much less energy in the U.S., as well as fewer people. Unfortunately, my fellow Americans - most notably politicians and journalists - are rather oblivious to the challenges of living off of renewables and to the scope of life-style changes that will ensue, including a dramatic decline in population. My fellow Americans are also unduly scared of the inevitable reductions of energy use coming their way just like day comes after night. Here "energy from renewables" is defined as heat and electricity generated from hydroelectric power stations, geothermal power stations, biomass co-generation facilities, wind turbines, biofuels, and solar thermal and photovoltaic panels. Let's start from the accounting of the heat and electricity generated from renewables. The Energy Information Administration (EIA) has been under a lot of political pressure to make renewables look good. For example, in EIA's spreadsheet Table1_2.xls, wind generated 0.546 quadrillion BTU's (quads) in 2008, but in mer_dataT07.02b.xls the actual electricity consumed in 2008 converts to 0.189 quads, which gives a very nice wind turbine utilization factor of 34%. In fairness to EIA, these 34% may also be the conversion factor from electricity to primary heat energy - they don't say. Similarly, corn ethanol gets 0.800 quads for the fuel heating value and 0.532 quads for co-products (as if though we were going to burn all that dry distiller grain etc., and cows could not eat the low-fossil-fuel-content grass). However, no energy charges for the massive fossil fuel subsidies of biofuels are subtracted (sic!). The same exaggeration applies to solar photovoltaics, but the amount of electricity they generated in 2008 was in the round-off error of other energy sources. And so on. 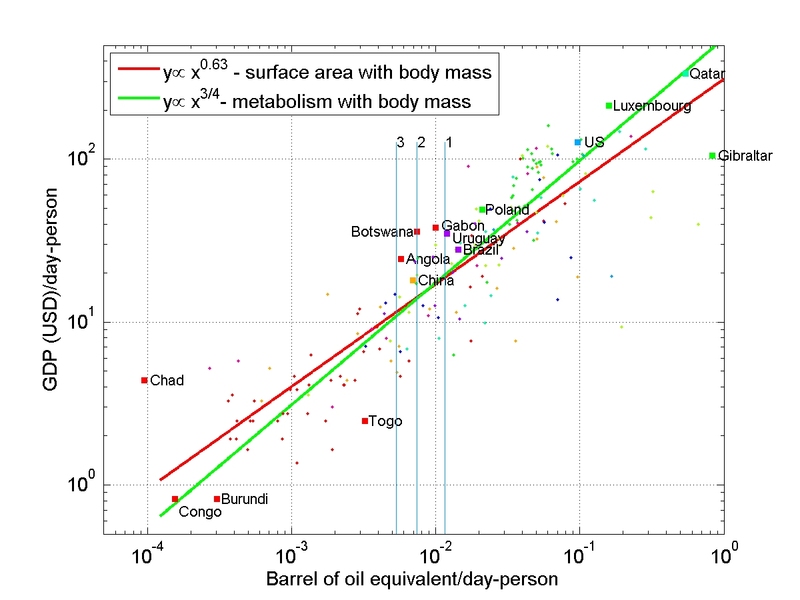 Therefore, in the plot below you will see the most generous, and perhaps not quite true energy throughput from renewables in the U.S., converted to barrels of oil equivalent per day per person. For more description of this plot, please see my previous post. The three vertical lines are the U.S.
All renewables minus hydropower minus biofuels and their coproducts (3). On a diet of renewables, a statistical U.S. resident who currently gulps a tenth of a barrel of oil equivalent (BOE) per day, will be sipping roughly 1/100 of BOE/day as renewables only, thus reducing the U.S. energy "metabolism" to the level of China, Gabon, Uruguay, Botswana, or Angola. One-tenth of a barrel is four gallons. Think four one-gallon milk jugs. Or think about 20 bottles of Scotch, 0.75L each. Try to drink that from a hose. One-hundredth of a barrel is 1.5 liters. Think of mineral water in a large bottle. Of course, I have cheated a little, because China, Angola, Gabon, Uruguay, and Botswana simply do not use much of hydrocarbons per person. However, China is the largest producer, importer and user of coal on the Earth, and the largest spewer of carbon dioxide. Angola is the eighth largest producer of oil in OPEC. Angola sells almost all of their oil to us. Botswana has huge deposits of coal. After completing a 1,200 mile, $9 billion railroad line to Namibia, funded by the World Bank, Botswana will be able to mine lots more coal and sell it to China. And so it goes. All of these five countries are significantly subsidized by natural gas, petroleum, and coal that are used for fertilizers, especially nitrogen fertilizers, and field chemicals. Petroleum literally drives current agriculture. Uruguay derives most of its income from agriculture. Still, you get my message, to undergo a successful diet of renewables, we in the U.S. will have to change our lifestyles more than at any time over the last 100 years. Now, let's imagine how we would live in a world with no hydrocarbons and coal. Luckily, this will not happen for many, many generations, except in California and Pennsylvania (I am only half-joking). Here are some of the effects: No liquid transportation fuels; no or little of the heavily fossil-fuel-dependent biofuels; a very different and better, but smaller agriculture with no GMOs; no plastics (bioplastics are impossible to produce without fossil fuels); and very few cosmetics, medications, household chemicals, and industrial chemicals. No significant production of steel and cement, and wind turbines, and nuclear reactors, and most of aluminum and copper, and of photovoltaic panels. No more driving a monster SUV, or any internal combustion engine car, to work and to shop, and positively no flying. Little or no air conditioning, and little heating. Most of the higher education as we know it today, unnecessary and gone. Most golf courses, gone. Los Angeles, Las Vegas and Reno: does anyone remember them? Most of New York, Washington, and all other mega-cities, gone. Growing rice and alfalfa in the desert, gone. Most agricultural irrigation projects, gone. City lights at night, gone. Most of our energy-intensive hospitals and health care, down. The military as we know it today, gone. Most of federal government, gone. Most lobbyists, gone. The United States is a loose collection of independent and often squabbling states, and many nation states disappear. Rockets, satellites, GPS, most of cellular phone communications, most of the internet, most of TV, cable, The Shopping Channel, Amazon.com, FedEx, UPS, Google.com, and this blog, - all gone. The global economy, and Walmart and Costco, gone. Suddenly, the oh-I-am-so-business-oriented governor of Florida, who rejected funding for trains does not look so smart. The V-8 powered troglodytes in New York, who are suing the city to get rid of bike paths, become ghosts of the past. In fact, most of us do not look very smart when we think back about our lifestyles and investment choices. Is it time for all of us to get smarter? My answer is, yes, it is time. Do I think that anyone but my family, some students, and a small group of friends will ever listen to me? Hell, no! Why? Read this, for example, to see how far we have strayed from a thinking society. OK, have you read the last link? Then please reflect on how full of contempt for all of us our rulers must be. Do they really think that we are mindless robots with no free will? In the wake of Friday’s natural disaster in northern Japan, and the growing nuclear catastrophe that it touched off, residents here are fast learning that many things they have taken for granted — fully stocked supermarkets, precisely punctual trains, power for their electronics and cars — can readily slip beyond their reach. Across the vast Tokyo metropolis, home to about one-quarter of the nation’s population, life has suddenly been upended in ways large and small. Some stores have been stripped bare of essentials like rice and milk, prompting the prime minister, Naoto Kan, to go on national television and implore people not to panic. Rolling blackouts to save energy have forced office workers to head home early rather than be trapped downtown. Many people are staying inside to avoid contact with any radioactivity from the stricken nuclear power plant in Fukushima, 170 miles to the north, that may be carried this way by the wind. This is very interesting, Tad, thanks. Those two posts developing the idea of power-rules for "societies" in the same breadth as power-rules for mammals are really thought-provoking. And that makes them good. I am not sure, yet--I have to think about it--that I really am convinced by the very specific relationship between these two very different systems ("societies" and mammals); I certainly do not have a convincing set of common mechanisms connecting the two (what people would refer to as "hard wiring"). So I am left thinking of these as nothing less (but also nothing more) than expressions of your own metaphorical world: the way you express what you can see and what you think will evolve out of what you can see. 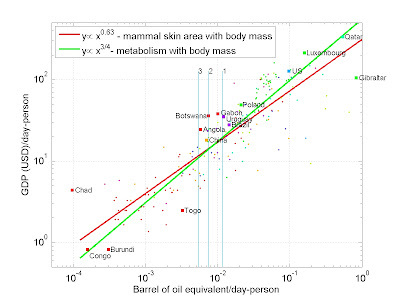 "...throughput rate of the hydrocarbon energy per person is equivalent to body mass of a mammal, and the societal metabolism (GDP/person-day) is equivalent to the rate of oxygen intake in mammals." Why this fudge (i.e. 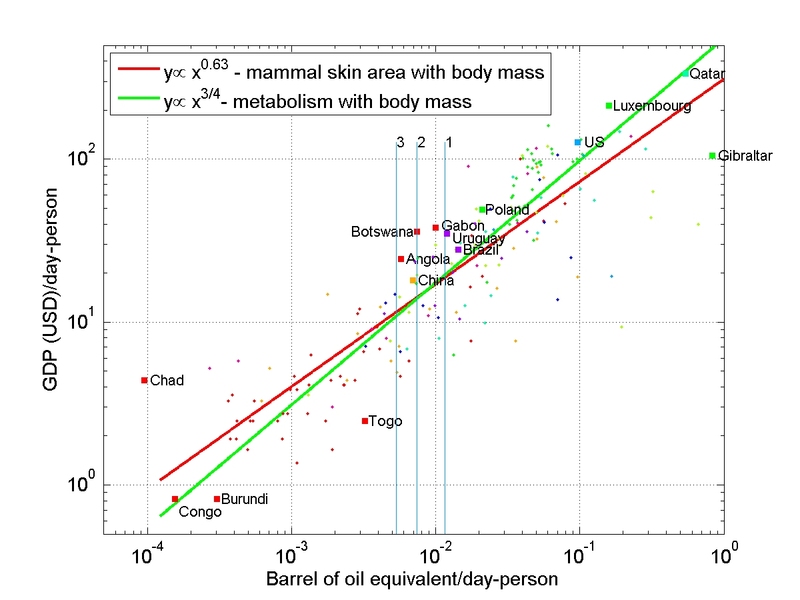 difference between oxygen-breathing mammals and oil/coal-burning groups of people) may exist is in itself an interesting question to ask, but I suspect that the linkage between oil/coal burning and GDP as measured by the CIA may leave much to be desired as a way of accounting for "social metabolism". I am sure I will be thinking about this, and hope to develop better insight into my questions. In the meantime, I just wanted to thank you for your public thoughts. I think we can get a lot more creative with low- to medium- tech, and certainly many good people are doing just that across the globe without much press and fanfare. How about utilizing improved wind turbine designs in mills for everything from food to wood? You would have to mill with the weather to some extent, but this is well worth exploring as an alternative. We have so much glass that can and should be recycled, so how can we integrate glass more into our daily lives? How about building homes with integrated greenhouse or sunroom space so that some food production can occur year around, plus these additions could possibly help mediate temperature swings, and maybe even filter water. I can see that we have many things we could be talking about in science and technology which aren’t very appealing to the “advanced” Westerner. How would a research institute focused on such low- to medium-tech solutions be perceived by the cutting-edge science journals and the national and international science societies? I think an important question is: how can we cultivate such research endeavors regardless of the predominant flow of mainstream beliefs and institutions? How can such endeavors fund themselves to remain viable independent of government grants and political mood-swings?